The threads are list in numerical order, if you have your list by the thread numbers, you can click here to convert that to alphabetical. 2017 Weeks Dye Works Nashville new colors are Cinnamon Twist, Garrison Green, Shepard's Blue, and Paris Green. Sandcastle, Driftwood, Blackboard, and Pepperoncini. 4 new colors are Wasabi, Persimmon, Sockeye, and Islamorada. One of each new color Flat Fish, Porpoise, Jay Bird and Candy Apple. 2014 (4) New Nashville colors. The colors are Cattail, Terrapin, Verdigris and Amethyst. 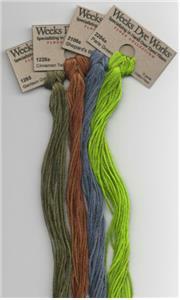 4 new colors for St. Charles Market.New colors are Oscar, Fathom, Chickpea, Blaze. 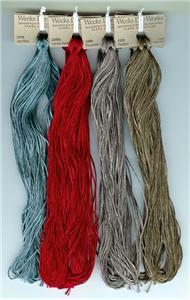 2013 Nashville Market new colors are Tatanka, Merlot, Spanish Moss, and Sea Glass. 4 new weeks dye works at 2012 Baltimore Market. Clockwork, Battleship, Cornsilk, and Pamilco. New Color 2011 Baltimore Market. 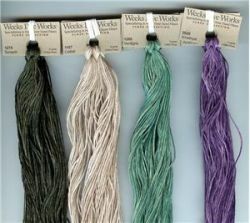 we carry weeks dye works floss.